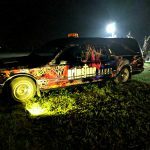 Brimstone Haunt is a Haunted Attraction located in Wilmington, OH. Team Zombillies reviewed this attraction on October 13, 2017. 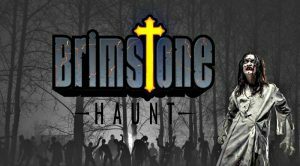 Brimstone Haunt is one of Ohio’s brand new attractions for the 2017 season. The Halloween fun takes place on the property of the Ohio Renaissance Festival and features two diverse attractions: The Forgotten Forest and Brimstone Haunted Hayride. When hayrides are involved, they usually fall within the “it’s the least in-your-face” realm, but that wasn’t the case here. The crew jumping aboard the wagon actually ended up being the most interactive ones we encountered on the property! The trail wound through the dark timbers of the property, where we became victims to many unsuspecting startles. Separate tickets for each attraction are offered here, but we highly recommend the combo package, as it’s hard to determine one haunt to visit over the other. They both offer something different, but they were both frightfully fun as well. For the length of the trail, it seemed that the cast could have covered quite a bit of area. However, at times we came across areas with little to nothing going on. Some characters didn’t attempt to interact with us much and there were other areas with up to five actors and actresses in them that were nearly drowning each other out trying to talk to us at the same time. Despite this, we came across some satisfying and energetic performances. The Boogeyman (one of the familiar faces from Springboro) led us through a closet and welcomed us into his realm. This creature has some crazy noises and demonstrated how he was keeping his eye on us… although it was no longer attached to a head! The Boogeyman’s counterpart victim was also very convincing and almost made us feel sorry for her… almost. The clown in the Hellevator was especially sneaky and several of the actors showed their ability to startle us by coming out of nowhere and suddenly appearing directly in front of us with acrobatic precision! On the hayride, many of the crew members were verbally and physically interactive with the riders. This was the most energetic group we have seen on a hayride and nearly all of them were focused on startling everyone on the wagon in any way that they could. Just when we thought they were gone, they would often pop back up over the rails! They were getting as close as they possibly could to all the perched victims on the ride, regardless if they were on the trailer or hanging on the sides. The castle maniacs took it as far as having Irish accents and their victims warned us of the gallows that waited ahead. The ring leader gave the most believable performance of them all as he seemingly bounced all over and off and on the wagon numerous times. The female clown with purple hair was also persuasive in her ways as she tried to get us to join their show. There was one actor who broke character, but other than that, this cast deserves a round of applause! 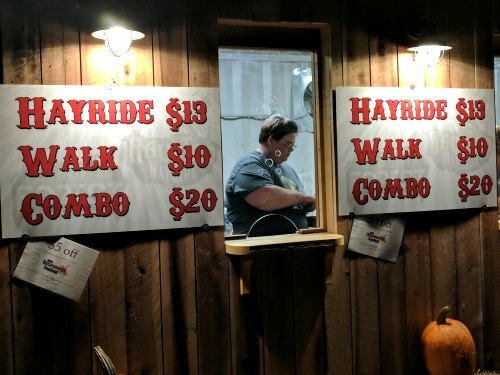 We were thoroughly impressed because hayrides are usually more of a challenging place to interact with and entertain customers, compared to walk-through attractions. A large variety of costumes were encountered in both attractions as well as the level of detail among them. This was especially apparent on the trail where some characters were just wearing masks with street clothes. 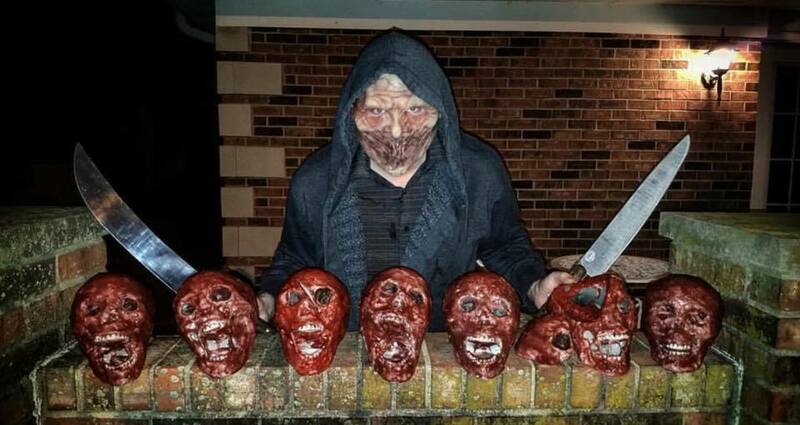 Then there were others that were complete from head to toe, such as the wooden doll, the boogeyman and his victim and those in the voodoo area. The rest of the dolls were also appropriately- and believably dressed; their makeup made it hard to tell that they weren’t real dolls! Another costume blended in so perfectly that, when combined with its unexpected placement, resulted in one of the biggest scares on the trail! 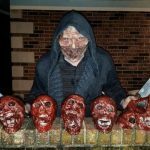 Some of the characters went above and beyond by sporting silicone masks, colored contacts and sharp teeth. In the past, most of the hayrides our team has experienced haven’t been lit very well, which can make it very hard to see the full extent of the costumes used by the characters that don’t board the wagon. Fortunately, that was not the case here. Not only were the scenes using an appropriate amount of lighting so the costumes could be seen, but most of the characters did, in fact, board the wagon, which gave us a chance to get an up-close and personal look at their costumes. The ones we encountered on the ride were complete and matched their respective scenes very well. Furthermore, the careful use of masks and makeup added a finishing and realistic touch to all of them. Notable costumes include those in the castle, the ones worn by the black riders and the clowns. A large sign at the nearest intersection and another at the entrance to the haunt helped us find the correct location. Many parking attendants with lighted wands were scattered throughout the very large, grassy and free parking area helping customers get parked easily. From there, we weren’t positive on where we needed to go as we had never been here before, but we figured we would just follow the lights in the distance and they ended up taking us to the ticket booth and midway area. The ticket booth and concession stands were clearly marked and very well lit. Navigating to the rest of the attractions was easy as well with several signs that lead you to your appropriate queue line (each being on opposite sides of the midway area). The haunts’ exits are also marked so you don’t mistakenly wander in the wrong way. Portable restrooms were located near the waiting area for the hayride and a string of rope lights across their tops helped light them up on the inside (we’re sure the ladies will appreciate this). Multiple waiting line entertainers were found interacting with guests while they waited, but other than that, there wasn’t really much else going on to keep them occupied. We must say that, for an outdoor event, everything was very safe. The parking lot was pretty leveled out and even the haunted trail was lined with gravel for safe walking. The wagons were also easy to access. Friendly staff were found in the concession and ticket areas and at the entrance to each haunt and each of them were happy to answer any questions we had. They also had haunt shirts for sale for those who love souvenirs! As we followed the light and neared the ticket booth, we could hear loud vehicles and screams coming from within the hayride. A radio station was heard in the central area of the haunts and there was some fall decor under the midway’s seating area tents, including pumpkins and corn stalks for a nice, autumn, harvest feel. The haunt’s awesomely-decorated hearse was a nice greeting and we did see a few costumed queue entertainers that helped establish the “haunted house” setting. 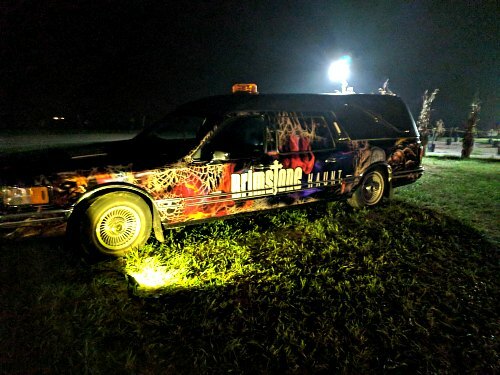 The special effects at Brimstone are a mixture of things that have been built in-house, purchased from vendors or the former Springboro haunt, and things that can run you over and flatten you out like a pancake! Yea, that’s right, they have several vicious vehicles here! There are two main effects that we really want to highlight on the trail and that is the lighting and the sound effects. A lot of the lighting included various colors of strategically-placed flood lights that provided a good mix of illumination on the trail and scenery without being too bright and giving away what’s ahead of you. The sound was downright nerve-racking in some areas, which kept us on our toes. We were told that these were all custom-made sounds for the haunt and, although we weren’t able to completely verify that, we can say that we don’t recall hearing these surreal sounds at any other haunt. While on the trail, we did come across some other impressive effects. We were forced to hunker down to make our way through a significant spider lair, cross a large swamp with a real bridge, the haunt’s own Hellevator (that showcased an interesting twist) and, speaking of twists, they’ve also got a pretty effective vortex tunnel. 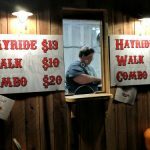 The hayride offered a huge variety of larger effects from blasting flames, LIVE animals and a giant castle to secretive scarecrows, a broken-down roller coaster, a massive circus area and multiple vehicles that chased us. We also want to strongly highlight the sound effects that were heard here. Unlike most hayrides we have experienced, the soundtrack for the hayride is played through speakers that are actually ON each wagon. On a few occasions, though, the sounds went off or played a clip that didn’t match the scenes they were heard in. But, overall, they were each of good quality and helped add an extra dimension to the experience. Neither haunt at Brimstone seemed to follow a single, cohesive theme. Instead, each attraction offered a large variety of singularly-themed scenes that ranged from common phobias and familiar creatures to custom creations of the haunt’s own design. The forest immediately started out with a great haunt-seekers treat involving a Hellavator surprise. From there we began our startle-driven journey through the winding paths of perennials. Some of the hiding spots were so natural and unexpected that we had a hard time predicting these scares. We also fell victim to some swift lunge attacks; one was so fast and effective that it almost made one of our team members jump over the side of a walkway! Although there were only two in our group, it did seem that they targeted the front most often, which was also the female in the group. We did have a group catch up with us pretty quickly here and, while they did try to slow down and keep some distance between us, they were just close enough that some of the scare attempts stayed hidden and waited for them, so we didn’t get to see everything that the trail has to offer. Just when you think you are safe within the confinements of a hayride wagon, you will quickly be proven otherwise. Nearly every scene we came upon landed us as victims to those who had climbed aboard the wagon and they weren’t afraid to “get friendly” with their visitors! At times there were so many actors and actresses within the scenes that it was nearly impossibly to predict or see where they were. Several close calls with vehicles kept us on high alert and one had an extra surprise (which was also the least expected feature of the entire ride)! Some distractions were used on the hayride that were nailing those sitting around us. They had one group sitting towards the rear so scared that they were all fighting over who would stay closest to the back! Tickets can be purchased for both attractions or just one. We highly recommend going with the combo ticket, as we feel that both individual haunts are well worth a visit. This is the option that we took and is also what we based our rating on for this category. General admission for the trail is priced at $10.00, the hayride is $13.00 and combo tickets are $20.00. Our group took roughly 14-1/2 minutes to find our way out of the forest and another 19 minutes to convince the clowns we didn’t need to join their circus. That brings the overall length to 33-1/2 minutes and, at $20.00 per person, makes their MPD (minutes of entertainment received per dollar spent) rating a 1.68, which is above the average of 1.5 that we see most often! In addition to their normal ticketing selections, they also offer a group party option where larger groups can rent a designated tent that’s away from the crowd, complete with its own seating! Contact the haunt for more information if that’s something you might be interested in.